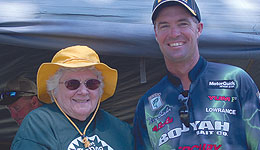 Three years ago, with the help of a local newspaper reporter, Bassmaster Elite Series pros Terry Butcher and Edwin Evers started an annual kids fishing derby on a pond near Oklahoma’s Lake Oologah. The third annual event, completed on June 4, proved their efforts were well-spent. Kids from ages two to 15 are eligible to compete, and they are divided into three age groups for awarding prizes in categories including longest fish, biggest fish and smallest fish. But no one goes home empty handed from the Kid’s Sun, Fun and Fishing Derby. Evers is speaking primarily of fishing tackle companies that have begun showering the kids with various kinds of equipment and lures. The U.S. Army Corps of Engineers has been behind this effort from the start. Oologah is a Corps-operated lake located 30 miles north of Tulsa, Okla.
And that’s just fine. The goal is for kids to get interested in fishing, any kind of fishing. Butcher and Evers are well on their way to assuring that the next generation near Lake Oologah is well aware of the sport.